S3000 DALI Power ctrl.unit FM ins. Automatic switching of lighting, depending on the movement of heat and ambient brightness. Operation with System 3000 switching or dimming insert or 3-wire auxiliary insert. Expansion of the detection range in combination with the 3-wire auxiliary insert. When connecting a System 3000 auxiliary insert with an operating top unit or mechanical button to the main unit, the lighting can be switched on or dimmed for the duration of the delay time. Device facilitates manual switchover between automatic, always-on and always-off. The switch-on brightness can only be saved permanently via the System 3000 auxiliary insert with operating top unit. Individually adjustable sensitivity of the two sensors (0, 25, 50, 75, 100 %). Override functions: Automatic mode, permanently on/off, time-limited on/off for 0.5 to 5 hours. 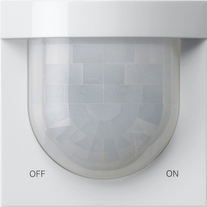 Switch on with the last brightness set, or a saved switch-on brightness in combination with a dimming insert.